Sometimes marks that look like hallmarks were applied to make a watch case look more impressive. 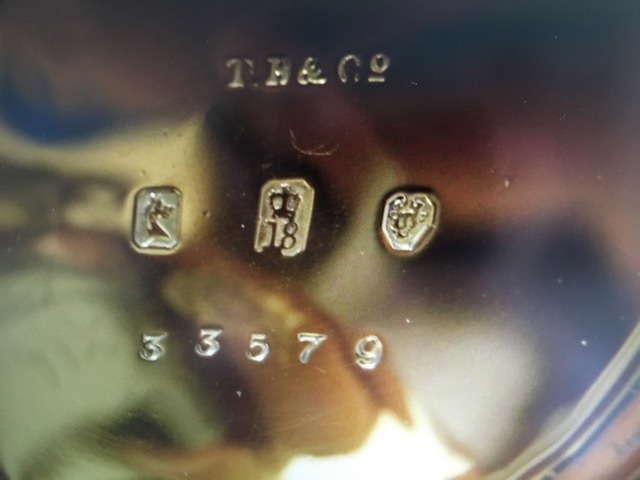 These marks are seen in cases made from silver and gold in countries that had no equaivalent of the system of hallmarking precious metal items that existed in the UK, and also in cases made of base metal such as nickel. It is not possible to ‘decipher’ these marks in the way that a British hallmark can be read, because they have no intrinsic meaning. This page shows some examples of such ‘fake’ and ‘pseudo’ hallmarks and explains what marks them out as not legal and genuine hallmarks. 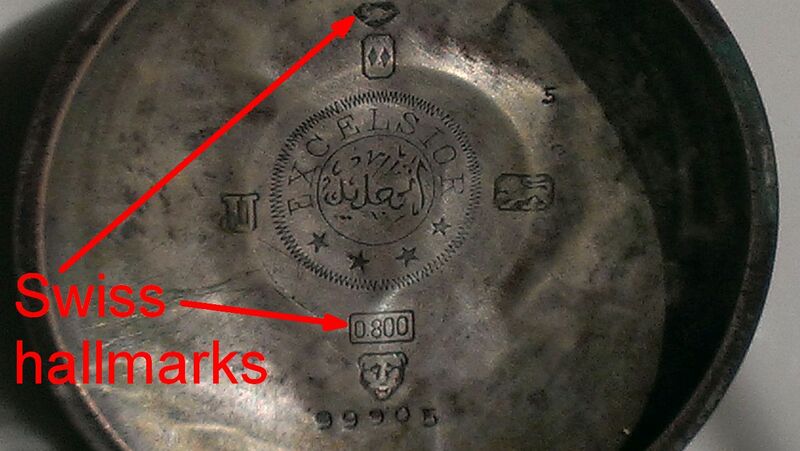 It might be thought that all marks that look like hallmarks but aren't are fake but this isn't necessarily so. Sometimes pseudo "hallmarks", marks that were meant to look like hallmarks without trying to be out-and-out fake hallmarks, were stamped in order to make a case look more impressive. In America, for instance, there has never been a system of hallmarking. But people knew that some good quality watches had hallmarked gold or silver cases, so would look down on a gold or silver case without any marks even if the retailer guaranteed that it was gold or silver. So sometimes marks that looked like the mysterious ‘hallmarks’ were stamped into a watch case to give the customer comfort. British hallmarks were sometimes faked or imitated, especially in the eighteenth century when English watchmaking enjoyed a reputation as the finest there was. Marks looking like British hallmarks were stamped into watch cases to lead people to think that a watch was of English make. Imitation British hallmarks are easy to spot if you are used to looking at genuine hallmarks, the individual punches are often the wrong shape or design or are applied in the wrong pattern. Although British hallmarking seems a simple subject, the number of subtle changes to the marks that have taken place over its 700 year history mean that it was quite difficult to imitate or forge successfully. There were no publicly available reference books or tables of British hallmarks until the Victorian era. Imitation British hallmarks often do not include a sponsor's mark. This is because the forger didn't appreciate the role and importance of the sponsor's mark, and didn't realise that although it was not a mark that was struck by the assay offices, an item would not even be accepted or considered for hallmarking unless it carried a valid sponsor's mark. The marks here look at first glance as if they might be British hallmarks; there is a leopard's head, a lion and what looks like a date letter, although there is no sponsor's mark. This is a serious omission on the part of the forger; a case would not be accepted for hallmarking without a sponsor's mark. These are not British hallmarks. They were stamped in a watch case with the intention of giving that impression, and deceiving a potential purchaser into thinking that the watch is English. The case is also hallmarked with the Swiss bear, this is quite a faint mark at the top under the lion. At first glance you don't see it, the other clearer marks catch the eye; perhaps this was the intention and the bear has been deliberately polished or rubbed to make it almost invisible. Once you notice it, it is clear what it is. There is also a 0.875 fineness mark in an oval in the centre. This is a legal Swiss standard of fineness that corresponds to the Swiss bear mark. These hallmarks were introduced by the Swiss Precious Metals Control Act of December 1880. The 0.875 fineness is below the minimum British legal sterling fineness for silver, which was and still is silver of 0.925 fineness, and therefore this watch case could not have been legally be hallmarked in a British assay office. Apart from the bear and the 0.875, another give away that these are not a British hallmark is that there are only three marks. There is no sponsor's mark. A sponsor's mark has been required as part of a valid and legal British hallmarks since 1363 so this item could not even have been submitted to a British assay office for hallmarking. The importance of the sponsor's mark is often not recognised, mainly as a result of it being erroneously referred to as a "maker's mark" as if it were simply some sort of trademark or logo. It is nothing of the sort, it is a responsibility mark, and the person who entered it at an assay office was responsible if the item was found to be sub-standard. As the penalties in times past included forfeiture of double the value of the item, imprisonment with hard labour, or being paraded through the streets and having your ears nailed to the stocks, this was not something to be taken lightly. An item could not be submitted for assay and hallmarking without a sponsor's mark and its absence condemns the other marks as fake. Finally, the three marks themselves bear little resemblance to British marks, or London marks as they are obviously intended to. The leopard's head is almost passable but looks too modern. The leopard's head is similar to the mark introduced in 1916, but the shield shape is wrong for that, it seems to be a combination of an earlier shield with a later representation. The marks intended to be the lion passant and the date letter bear no resemblance to any mark ever used by the London assay office. The lion is not a bad representation of a lion per se, but it is not the noble beast from the Royal standard walking with three paws firmly on the ground and right forepaw raised, and the "U" date letter is crude in comparison to the punches used by the London Assay Office. The numerals on the dial of the watch with these marks are Turkish and there is no doubt that this watch was made for the Turkish market and was first sold in Turkey. Similar fake British hallmarks are also seen on watches with normal Arabic or Roman numerals that were obviously not for the Turkish market but were probably intended for markets where English watches were held in high regard but genuine British hallmarks not well known. Four of the marks here look at first glance as if they might be British hallmarks; there is a leopard's head, a lion, what looks like a date letter, and what might be a sponsor's mark. These are not British hallmarks. They were stamped in a watch case with the intention of giving that impression, and deceiving a potential purchaser into thinking that the watch is English. The case also has Swiss hallmarks, which I have arrowed in red, at the top a grouse, and below the centre a 0.800 fineness mark in an rectangle, the legal Swiss standard of fineness that corresponds to the grouse mark. 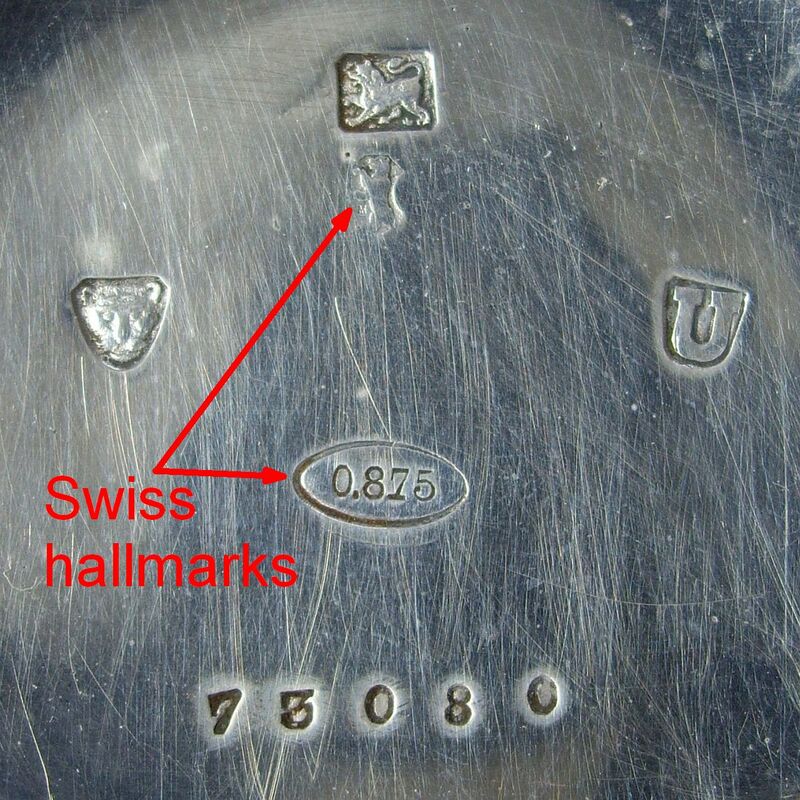 These hallmarks were introduced by the Swiss Precious Metals Control Act of December 1880. The 0.800 fineness is below the minimum British legal sterling fineness for silver, which was and still is silver of 0.925 fineness, and therefore this watch case could not have been legally be hallmarked in a British assay office. The supposed hallmarks bear little resemblance to British marks, or London marks as they are obviously intended to. 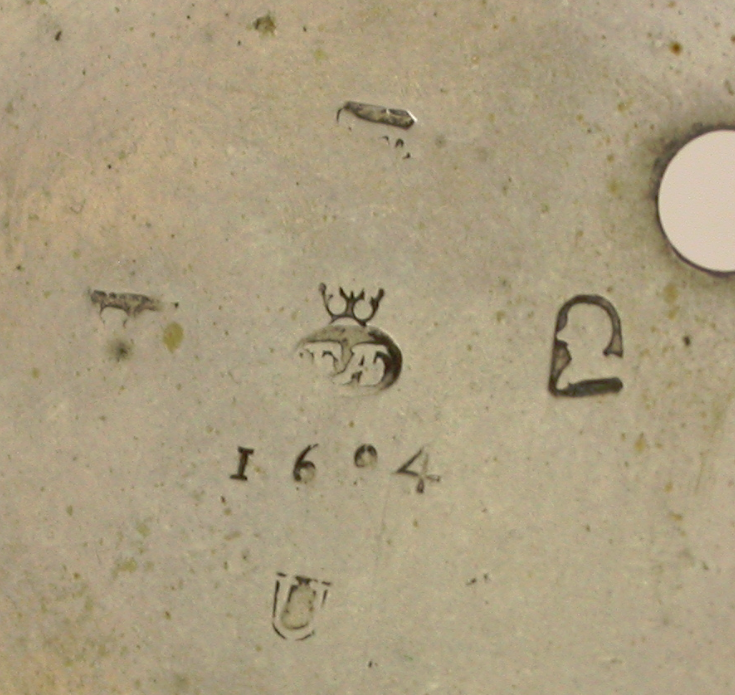 The leopard's head is unlike any punch ever used by the London Assay Office and similarly the marks intended to be the lion passant and the date letter bear little or no resemblance to any mark ever used in London. The lion is not too bad, but the "U" date letter is very crude. The name Excelsior seen in the centre of the case back was used by Dent, a well known English watchmaker. However, I found at least 37 examples of the same name Excelsior registered as trademarks by Swiss, German and American watchmaking companies or dealers. The numerals on the dial of the watch are Turkish and the writing under the Excelsior in the back of he case is Turkish. There is no doubt that this watch was made for the Turkish market and was first sold in Turkey. It never went anywhere near an English assay office. Similar fake British hallmarks are also seen on watches with normal Arabic or Roman numerals that were obviously not for the Turkish market but were probably intended for markets where English watches were held in high regard but genuine British hallmarks not well known. 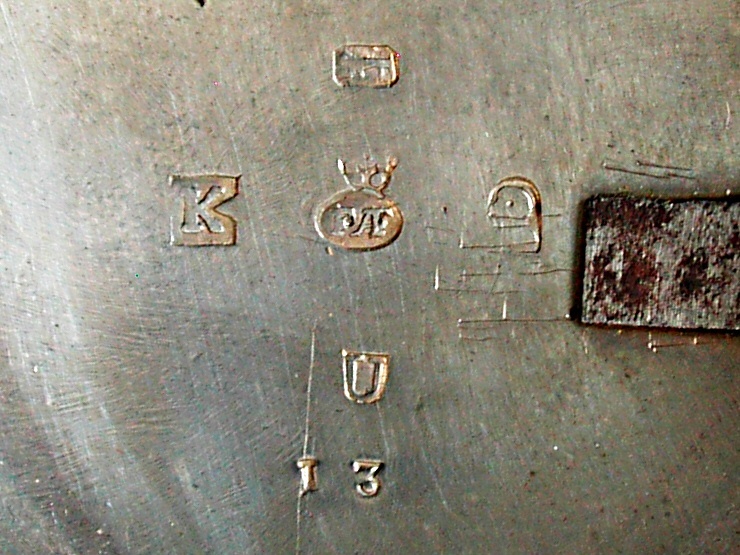 The image shows a set of marks in a nickel case that seem to have been intended to look like British hallmarks. There is a set of four marks, the minimum requirement for a valid and legal British hallmark since 1544, and they are arranged in approximately the pattern of a British hallmark. The word "Swiss" below the marks doesn't automatically mean that they are fake British hallmarks. Before 1888 it was legal for foreign made watch cases to be hallmarked in a British assay office, and some Swiss made gold and silver cases were, particularly between 1874 and 1877. But this is not such a case and the marks are not British hallmarks. Two of the marks do look quite like parts of a British hallmark. The letter "o" on the left looks like a British hallmark date letter, and the pair of initials in a rectangular shield look like a sponsor's mark. However, the two star shaped marks at the top and left bear no resemblance to any genuine legal British or Swiss hallmark. Although I can't be sure from an image, I think that this case is probably nickel or nickel-silver. Base metals such as nickel and nickel-silver not only didn't need to be hallmarked, they couldn't be hallmarked; there was no provision for hallmarking anything other than precious metals; at first gold and silver, and later platinum. My conclusion is that the marks, which were clearly intended to look like hallmarks, are present in this watch case just to dress it up a bit. The marks here that look somewhat like they might be British hallmarks on 18 carat gold might cause many to pause and wonder if they are genuine. There is what looks like a sponsor's mark, the initials "T H & Co" struck incuse. There is also the figure 18 with a crown over it, which looks quite like a real British 18 carat mark, and there are two other symbols that look like parts of a genuine British hallmark and make up the minimum set of four marks that have been required for a valid and legal hallmark since 1544. However, these are fake marks that were clearly designed and made with the intention of fooling people into thinking that they are genuine British hallmarks. How can you tell that they are not genuine British hallmarks? Well for starters the the marks that is supposed to be the leopard's head of the London Assay Office looks wrong. When it was first introduced the leopard's head had a full mane and beard as this mark appears to have, but these were quickly lost and the leopard appeared with a shaved chin and various forms of crown until 1821, after which he lost his crown. This mark and its encompassing shield look like none of the various forms of the leopard's head. However, the easiest to spot and the real clincher is the mark on the left that looks like a horse's head, which has no place in a British hallmark. Given that the other three marks were clearly intended to be the sponsor's mark, the town mark and the standard mark, this mark should be an alphabetical date letter showing when the item was assayed and hallmarked. 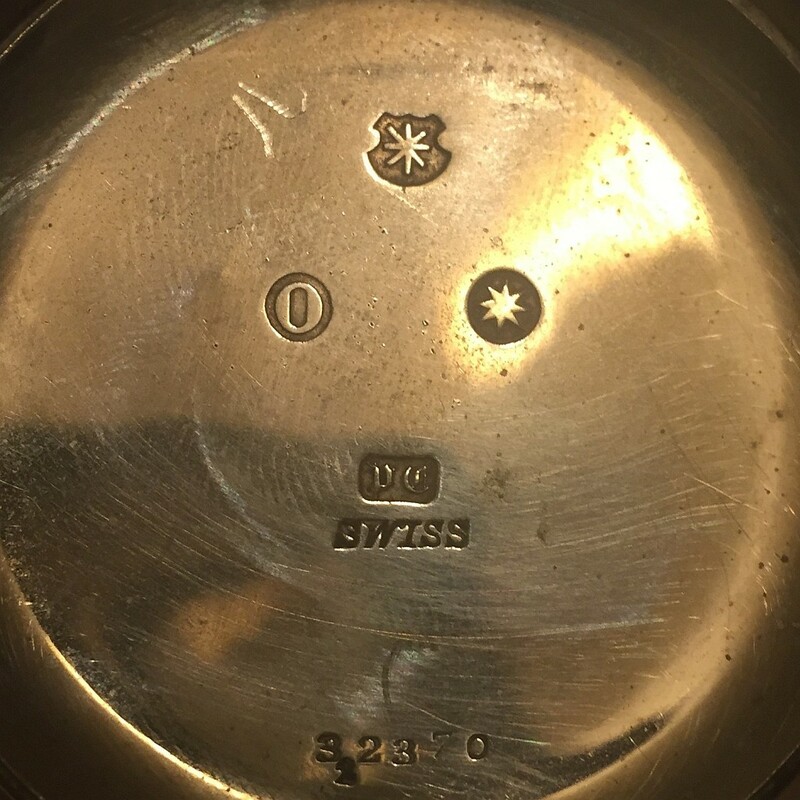 British hallmarking on the face of it seems to be a simple matter, but due to its evolution over centuries it is surprisingly complex and forgers often make a simple mistake that gives the game away. In this case the forger has made a good attempt and three out of four of the individual marks bear a resemblance to real hallmarks. But three out of four is not good enough, and the horse's head is a real give away that these are fake hallmarks. The marks in the watch case backs shown here are interesting because although they are clearly fake marks intended to fool someone into thinking that they are British hallmarks, they include a duty mark. The duty mark was only struck on watch cases for a limited period, and the presence of a fake duty mark in this watch case might actually give a clue as to when it was made. The two images are from different watches, which is why the marks are rubbed to different amounts, but they are notably a virtually identical set of marks! They are obviously fake because although they are laid out in a manner that resembles British hallmarks, the individual symbols bear no resemblance to genuine British hallmarks. The supposed sponsor's mark in the centre has a device that looks like a stag's antlers on top, which was not allowed. The supposed lion passant at the top of the first image looks more like a dead sheep than the noble beast from the English Royal standard. The capital K in a close fitting shield bears no resemblance to any official British mark. The supposed date letter "U" bears no resemblance to any date letter used by the London Assay Office. 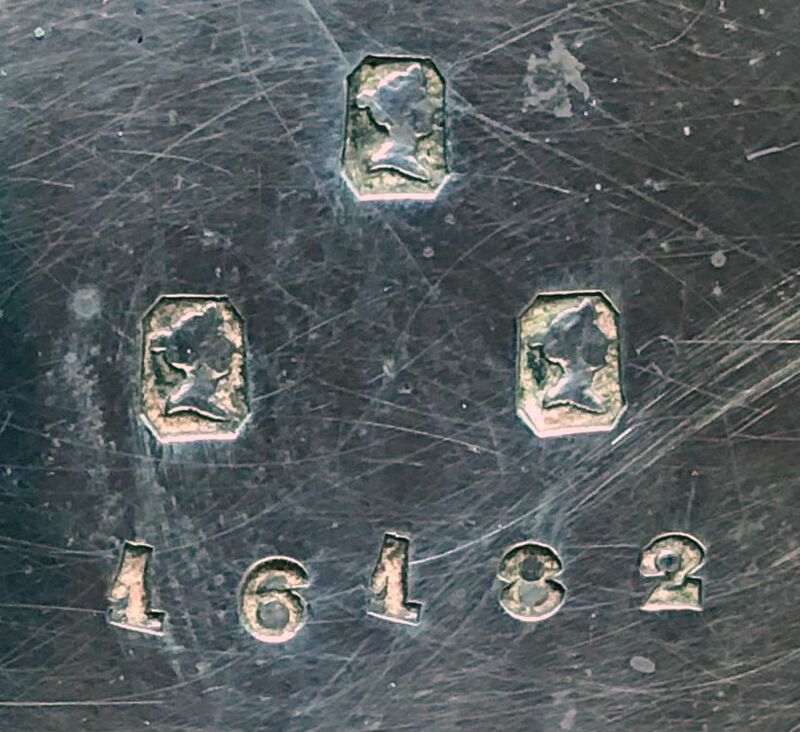 The most unusual item in these sets of marks is the head and shoulders to the right of each. It is faint but visible in the first image next to the steel case catch spring. This is clearly intended to be a British duty mark, which was only impressed on watch cases between 1784 and 1798 as explained below. This suggests that the forger had a reasonable knowledge of British hallmarks, although not sufficient to make a good set of fakes. An alternative thought is that because the penalties for forging hallmarks convincingly were severe, perhaps these marks were deliberately made badly with the intention of saying that they would fool no one if the forger was arrested and the case came to trial. This seems unlikely though; it seems prima facie that the marks were intended to be taken as British hallmarks. The three lady's heads shown here are "pseudo hallmarks". They are not hallmarks and have no legal standing, but were meant to impress a purchaser. People knew that some good quality watches had hallmarked gold or silver cases, so would look down on a gold or silver case without any marks even if the retailer guaranteed that it really was gold or silver. So sometimes marks that looked like the mysterious ‘hallmarks’ were stamped into a watch case to give the customer comfort. The watch has the name ‘M. H. Gridley, Logansport Indiana’ and a serial number on the dial. Gridley was born in 1818 and had a shop for “Clocks,Watches and Jewellery”. The same name, location and serial number are also engraved on the movement. In common with English practice at the time, it is the retailer's name that appears on the watch. The movement looks like English work, probably Liverpool from large the size of the visible jewels, called "Liverpool windows". It was most likely exported as a bare movement and cased in the USA where there has never been a system of hallmarking, hence the pseudo marks. Before the American watch industry got started in the 1850s, there was a big trade in exporting watches from Britain to the USA. Often movements were exported bare and cased in the USA, because the movements could not be made in the USA at the time, but cases could be made more cheaply there than English cases could be bought.